"We have been reduced roughly to the size of an inch!" Welcome to Doctor Who, series 2, resuming seven weeks after the close of the first series. 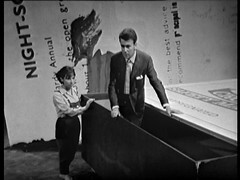 The Tardis is in flight and approaching a planet when Barbara burns her hand on the console. The doors open mid-flight causing an alarm to sound, wrestling with the controls the Doctor lands the Tardis. 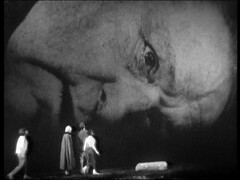 The Fault Locator, always a tricky one for Hartnell to pronounce, indicates no problem, but the scanner shatters when turned on. They leave the Tardis to see what has happened. The Doctor says the space pressure was too great forcing the doors to open..... The rock formations outside are odd. Barbara encounters a huge dead snake which interests the Doctor, while Ian and Susan find giant eggs and a dead giant ant. The Doctor & Barbara note that the rock formations form a maze like the surface of a brain. Ian encounters a huge poster in English: he realises they're on Earth and wonders if they're in an exhibition of giant sized objects. The Doctor is nearly crushed by a giant match stick and realises what has happened. Ian & Susan find a giant match box,convincing him they're in an exhibition but Susan believes differently: They've been shrunk! The camera pulls back from the Tardis to reveal it in the crazy paving of a garden path! It goes black and a thunderous noise is heard. Susan runs away while Ian hides in the match box:a huge figure bends down and picks it up. The Doctor scales the wall and sees where they are. The man who owns the matchbox, Arnold Farrow, is a government scientist here to see the businessman owner of the house, Forrester, who is developing a new pesticide DN6. Farrow has come to refuse Forrester a licence to produce DN6. Forrester isn't happy, having ploughed all his money into DN6. He threatens Farrow with a gun. The Doctor, Susan & Barbara are menaced by a bee which dies, they smell something odd on the insect. There's a HUGE explosion to their ears: Farrow is dead shot by Forrester. Ian is reunited with the others and takes them to Farrow's body. The Doctor wants to return to the ship but their way is blocked by Forrester's cat, giant sized compared to them. Good start to the season, with some great model & effects work producing the giant items. Mervyn Pinfield, the show's associate producer, is in the Director's chair for the first couple of episodes and he was renowned for being good with advanced technical matters. The quite clever cutting between Dr & Barbara and Ian & Susan during the explanation scene also works very well. Farrow's face is obviously a blown up photo, though to be charitable that probably worked better on the 405 line TVs of the time. 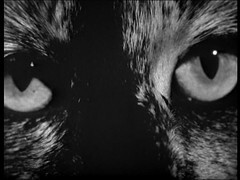 The close up of the cat's face meanwhile somehow lacks menace without being able to get the crew into shot with it. A notable first: Even though the Tardis crew are shrunken in size this is their first return to present day (for them) Earth! FORRESTER: I see. You're aware, of course, that if it doesn't go into production I shall be completely ruined. FARROW: That is very unfortunate, but really you should have waited until we'd given you the go-ahead. FORRESTER: Well that's all very well, but it doesn't help me, does it. Surely we can work something out. There's a fortune to be made out of this. FARROW: This isn't business, this is science. The formula is unacceptable and I can't, and I do mean can't, Mister Forrester, allow DN6 to go into production. SUSAN: What worries me is all the different things it's killing. Things that fly in the air, things that move on the ground, things that move under the ground. It's so indiscriminate. BARBARA: Doctor, whatever it is that's killing these things, could it kill us too? DOCTOR: Well, we must presume that it can. So no eating or drinking until we've done our very best to find Ian, hmm? BARBARA: What would kill insects in a perfectly ordinary garden. I mean, pests one can understand, but surely it's wrong to bees and worms and things, isn't it? DOCTOR: Quite so. Both are vital to the growth of things. These sections also help to meet the show's educational criteria by making people aware of the contribution insects make to the environment. The dialogue, even though it's fifty years old, still is ever so relevant today with pesticide stories featuring in the news only recently. For my friends from, University: This is the episode where the line "Susan, check the fault locator please" appears. To my hearing that's exactly what the Doctor says but you mileage may vary. Discounting the cat there are but two guest performers in this episode and one of them plays a character that's shuffled off this mortal coil already. Frank Crawshaw plays the already deceased Farrow. He's best known for playing Arnold Tanner, Elsie Tanner's first husband, in Coronation Street. 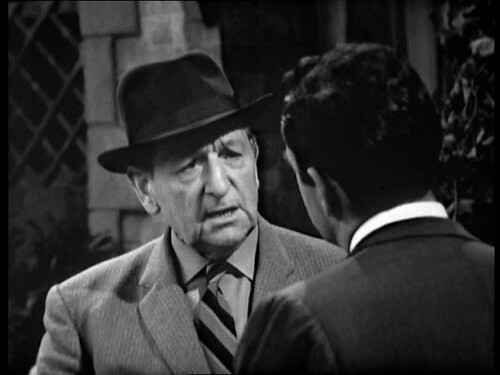 This episode marks the debut of composer Dudley Simpson on Doctor Who. He would work regularly as the show's composer eventually composing most of the scores to Jon Pertwee & Tom Baker's stories to the end of Baker's penultimate season. The VHS release of this story marks the debut of the VIDFire process. In simple terms: Video (in the UK at least) is 50 Frames Per Second (fps) and film is 25fps. When Doctor Who was transferred to film for overseas sale half the frames were lost resulting in a less fluid picture flow. VIDFire interpolates the missing film frames from the existing ones using computer software. It works something like if an object is here in this frame, and there in the next, then in an in between Frame it would have moved half the distance.